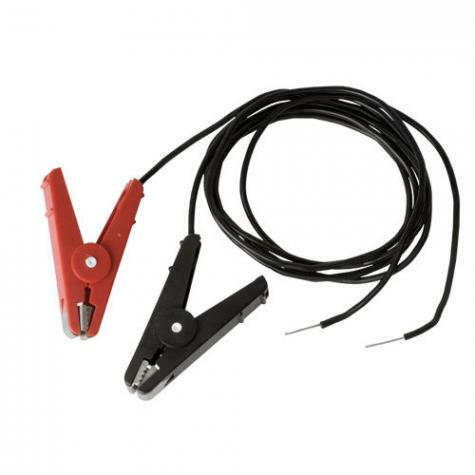 Positive connector (red plastic alligator clip) with metal tips on one end of cable for the fence. The other end of the cable is bare to connect to the energizer fence terminal. Negative connector (black plastic alligator clip) with metal tips on one end of cable for ground rod. The other end of the cable is bare to connect to the energizer ground terminal. Black lead 48" inches and red lead 48"
Large & secure clips make connecting to fence and ground rod easy. Make sure the energizer is in the OFF position or unplugged. May get a shock if holding onto the clip in the rain. Make sure bare wire is connected well. Make sure the crimp sleeve is connected inside the alligator clips. Make sure the clip is getting a good connection to the fence or ground. An 8 joule plug-in energizer for long livestock fences with heavy weed loads. A 6 joule plug-in energizer for medium to long livestock fences. Does well in moist soils. Was purchased to replace leads on my PRS100X. Easy peasy to install, no problems at all. The customer support person I talked to on the phone helpfully guided me to the item I needed. Very quick delivery following my order. The item was easy to install and exactly what I needed. It came sooner then expected. Easily installed! Received very quickly, and the clamps were easily installed, no problems.